Frameless SMT Stencils at BEST Inc.
Frameless SMT Stencil Search Catalog / Place OrderFrameless SMT stencils are laser cut solder paste stencils designed to work with stencil tensioning systems or for prototyping and hand printing. These laser cut stencils are not designed for nor do they need to be permanently glued in a frame. Frameless stencils are less expensive than framed stencils and reduce storage requirements. 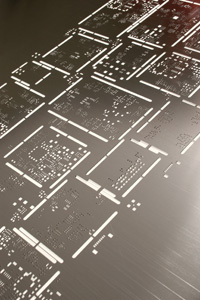 These frameless SMT stencils are designed for paste printing on printed circuit boards. BEST's frameless SMT stencils provide optimum solder paste volume control. They have very smooth aperture walls and can be used for ultra fine pitch, uBGAs and very small bottom terminated components. The PHD high nickel content stainless steel has very small grain structures which allow the paste to be released and maximize transfer efficiency of the solder paste form the stencil aperture to the PCB. BEST frameless stencils can be configured for DEK™, QTS and several others. If you have a unique pattern we can take your previous stencil files and recreate them. If you are building prototype boards requiring only a few prints then BEST can get you frameless stencils quickly. We can even bend up the edges so that solder paste does not smear to other areas of the PCB. Ask us about our prototyping kit which includes board holders and a squeegee with these frameless SMT stencils. After sending us the GERBER files and other process information BEST SMT engineers will modify the apertures for best possible SMT printing performance. You will be “plugged in to” our staff’s many years of experience for best possible assembly outcomes. We will then quickly send out a checkplot for your approval. After being accepted we will get you right in to our build schedule for quick shipment. To place an order call BEST at 847·797·9250 or order here.